Born in 1923 the son of Frederick L. Attenborough (Principal of the University College, Leicester, and President of the Society in 1945-46), Richard Attenborough was brought up in Leicester and was educated at the Wyggeston Grammar School. After amateur performances with the School and the Leicester Little Theatre, he was awarded a Leverhulme Scholarship to the Royal College of Dramatic Art (RADA) in 1941. While still in his teens he made his West End debut and also gained an international reputation through his part in Noel Coward’s 1942 war film In which We Serve. A stage and film acting career of more than 60 years has been complemented by an equally distinguished career as a producer and director, beginning with award-winning Oh! What a Lovely War in 1968, and including Gandhi (1981 – eight Oscars) and Cry Freedom. 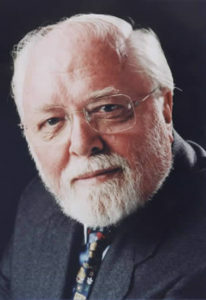 Richard Attenborough also has a remarkable record of public and charitable work, including membership of the Arts Council of Great Britain (1970-73), service as a Trustee of the Tate Gallery (1976-82 and 1994-96), and in chairing the very influential Committee of Inquiry into the Arts and Disable People (1983-85). National recognition has included a CBE in 1967, Knighthood in 1976, and a Life Peerage in 1993; international awards have included Martin Luther King, Jr Peace Prize, 1983, Padma Bhushan (India), 1983, Commandeur, Ordre des Arts et des Lettres (France), 1985; Chevalier, Légion d’Honneur (France), 1988, and the Directors’ Guild of America Award for Outstanding Directorial Achievement), 1980–81. Locally, he received an Honorary DLitt. From the University of Leicester in 1970, and was made an Honorary Freeman of the City of Leicester in 1990. He has been Patron of Leicester University’s Richard Attenborough Centre for Disability and the Arts, named in his honour, since 1990. A noted collector of contemporary art, making his first purchases while still at school, he and his wife, the stage, film and television actress Sheila Sim have been collecting for some years the ceramics of Pablo Picasso, and have arranged for much if not all of the collection to be left to the Leicester Museum and Art Gallery in memory of their daughter who died in the Boxing Day tsunami. Presidential Address: Sixty Years in the Movies. LLPS Transactions Vol. 94 (2000). Pp. 1-2.